Google did. This is one of the original server racks, now on display in the Computer History Museum. Actually for me this was one of the most impressive things that Google did. When I first heard about it I wondered how I could do something similar. Why have a rack with 1u cases (or 1u back to back cases) when you can just stick motherboards in. It is somewhat like a low tech blade server - except it works and is cheaper. 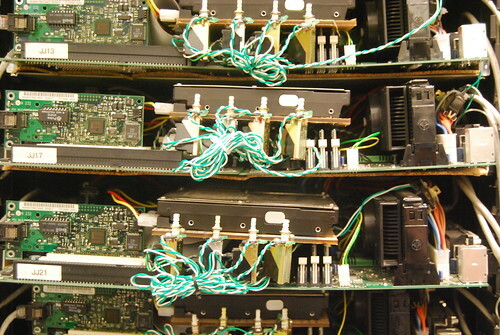 I'd love to see more photos of how they created those hard disk shelves and how they did the power supplies. 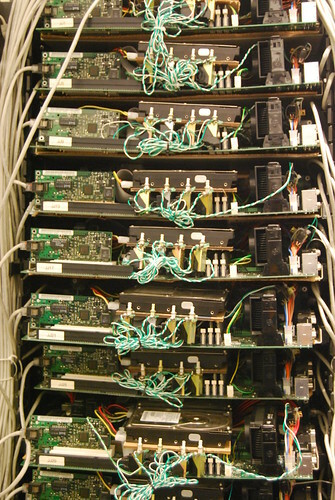 And shockingly enough.... they actually had to put network cards in - they didnt have them on the motherboards! works for values of you don't care how many fail. they had major cooling problems and no longer do it like this. you need a revenue stream that allows you to replace as many as you need and an OS that distributes your apps and works around hardware failure.